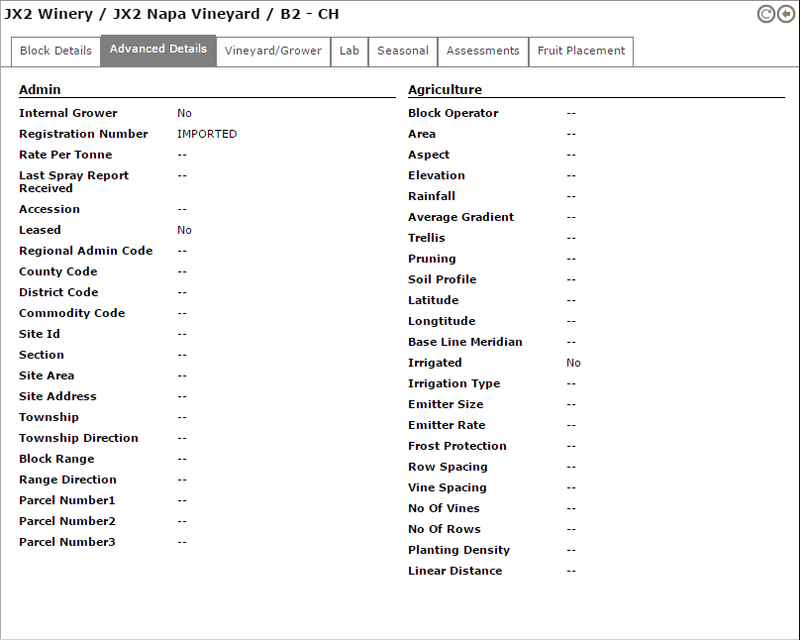 The Block Overview provides a central view for you to manage your block details, fruit sampling and viticulture assessments. Access the Block Overview by searching for a block by code using the QuickSearch or by accessing the Search – Block overview menu. Using the options on the left you can search by common block properties. Make a selection from the resulting list to see more information about a particular block. Use the New option in the lower left corner to quickly create a new Block, Vineyard or Grower. 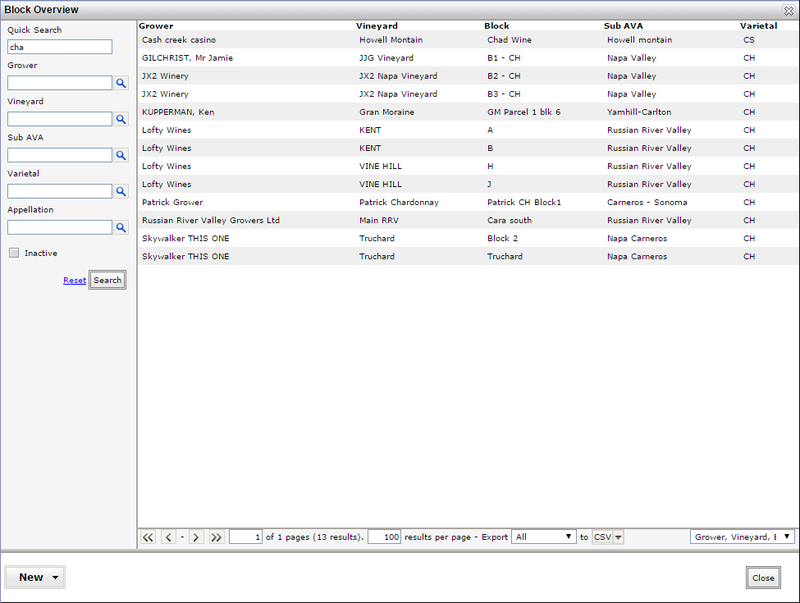 The block information is organized into a series of tabs with menu options at the bottom to perform common functions. 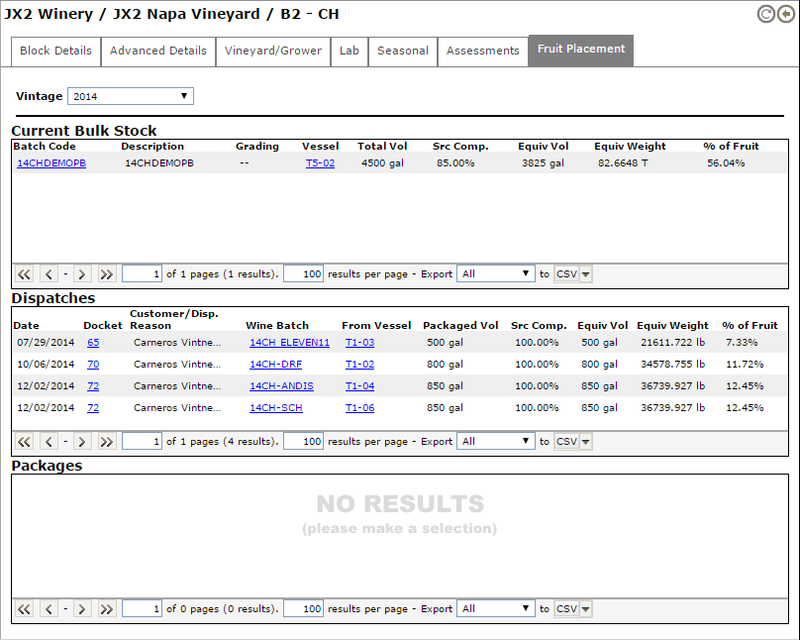 Block details – this tab shows key information including the Grower, Varietal and Region (Sub AVA). You can select the edit pencil icon to make adjustments. A chart showing the expected versus received tonnage for the life of this block in the system is also shown. Advanced details – this tab contains more advanced information that can be tracked against a block. Use the pencil icon to make adjustments. It is broken into the following two main sections: Admin and Agriculture. 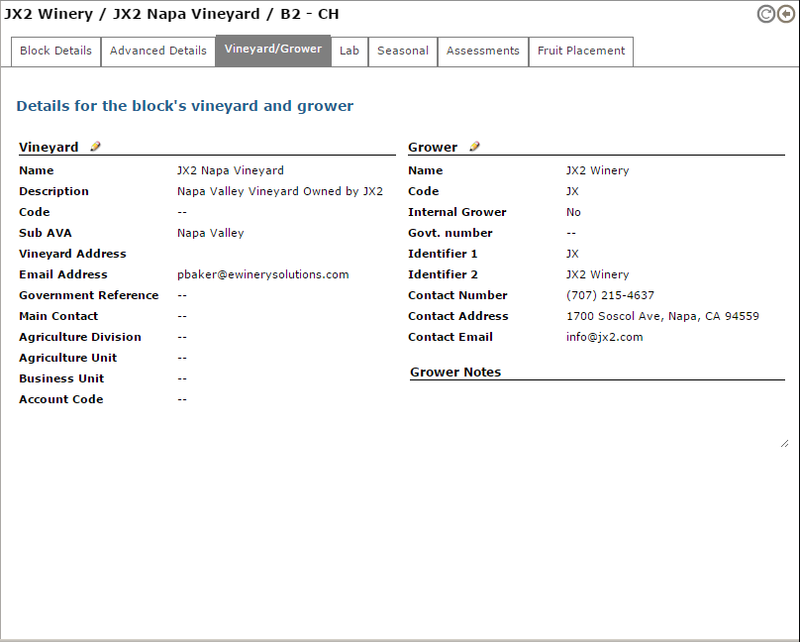 Vineyard/Grower – this tab shows detail about the Vineyard and Grower linked to this block, including contact information for the Grower. Use the pencil icon to make adjustments. 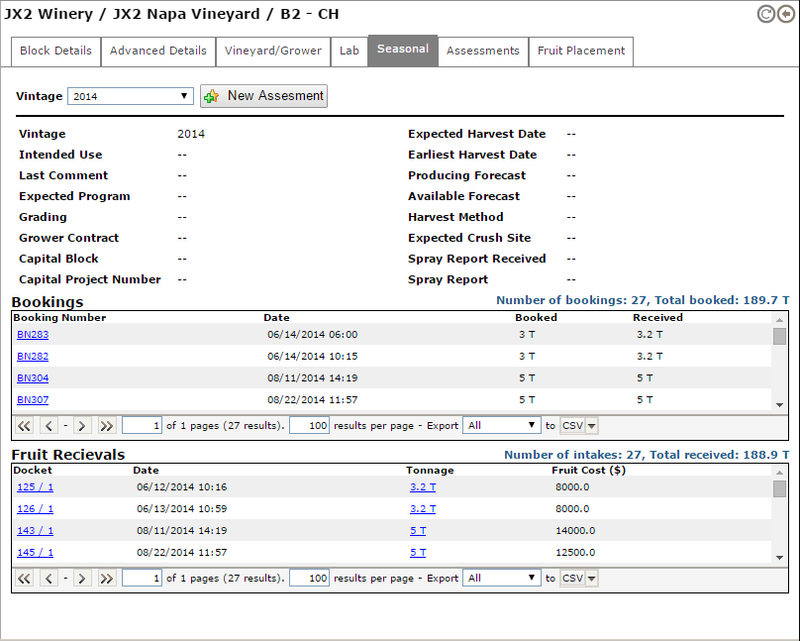 Lab – the lab tab shows fruit maturity data as recorded into the system for this block each season. See the latest results at a glance and use the Record a fruit sample button to add new maturity lab data. 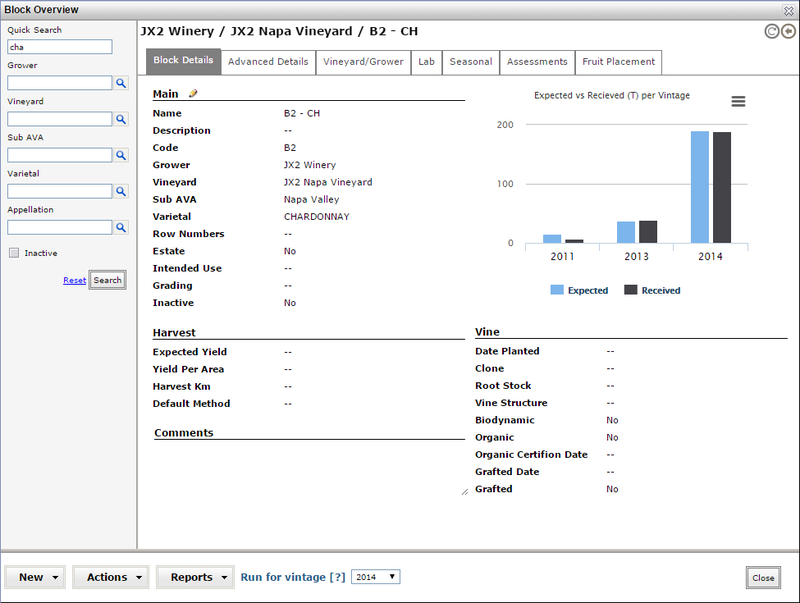 Clicking the Chart option will show a historical chart of analysis entered against this block for the selected Vintage. 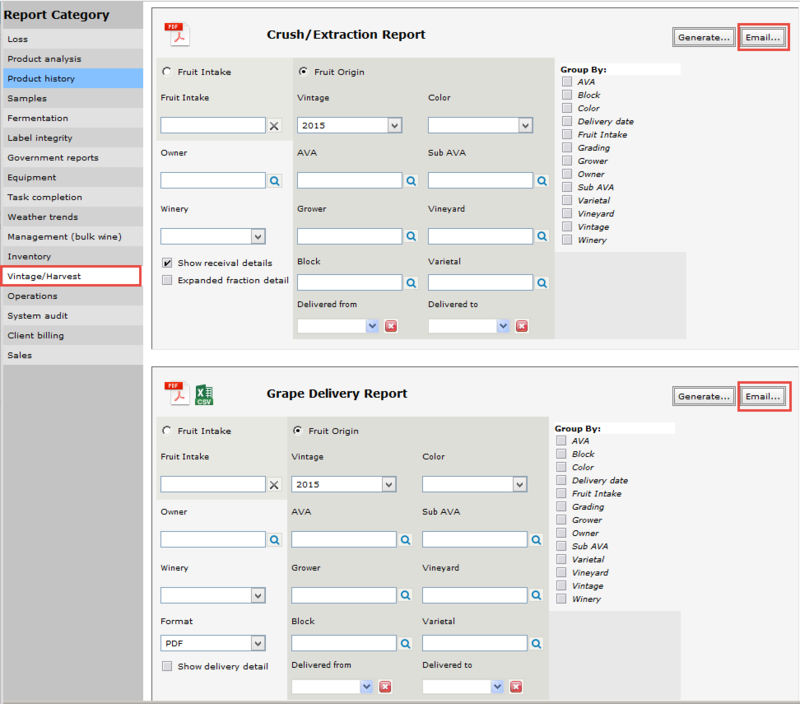 Use the options at the bottom to export the information into CSV or PDF. Seasonal – the season tab shows viticulture assessment information for the currently selected Vintage as well as all Fruit bookings scheduled and Fruit receivals into your facility. Quickly access the booking or the fruit arrival by clicking the links provided. 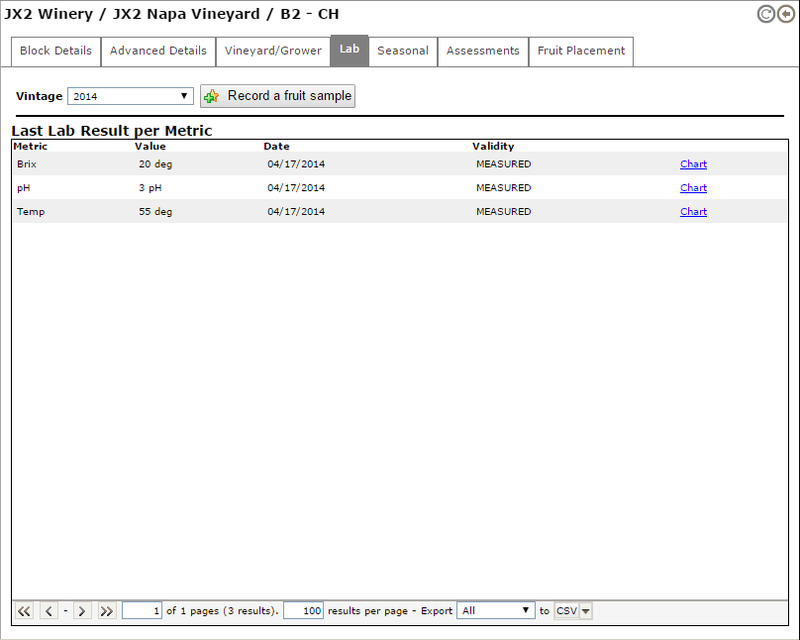 Assessments – this tab allows you to view all past assessments recorded against this block for the selected Vintage. An assessment is used to record the seasonal progress of a block for a particular Vintage. By making regular assessments of a block you can easily see how the block is tracking over time in the lead up to harvest. Use the New Assessment button to record an assessment. This also updates the information shown on the Seasonal tab. Click here for a detailed article on Assessments. This feature is only available in vintrace Professional and Enterprise you will need to upgrade from Essentials to use this feature. Fruit placement – this tab shows the Current Bulk Stock, Dispatches and Packagings where this block has been involved. It is a powerful tool that allows you to answer many auditor questions relating to the destination of fruit received at your scales and recorded in vintrace. 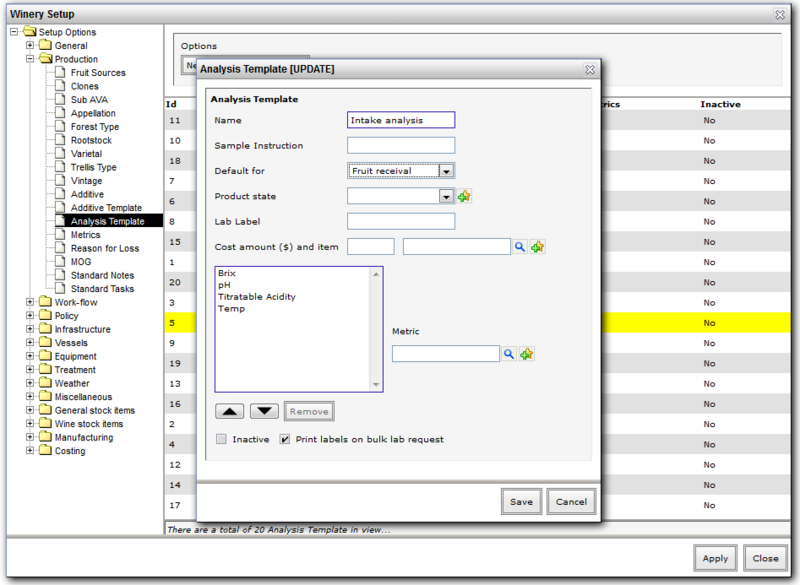 Analysis Templates are used throughout the system to group common metrics together and provide the necessary fields when recording measurements in different situations. For example, you will take different readings for a grape sample compared with a ferment analysis. We recommend reviewing the standard templates ahead of vintage to ensure all metrics recorded by your lab are present. 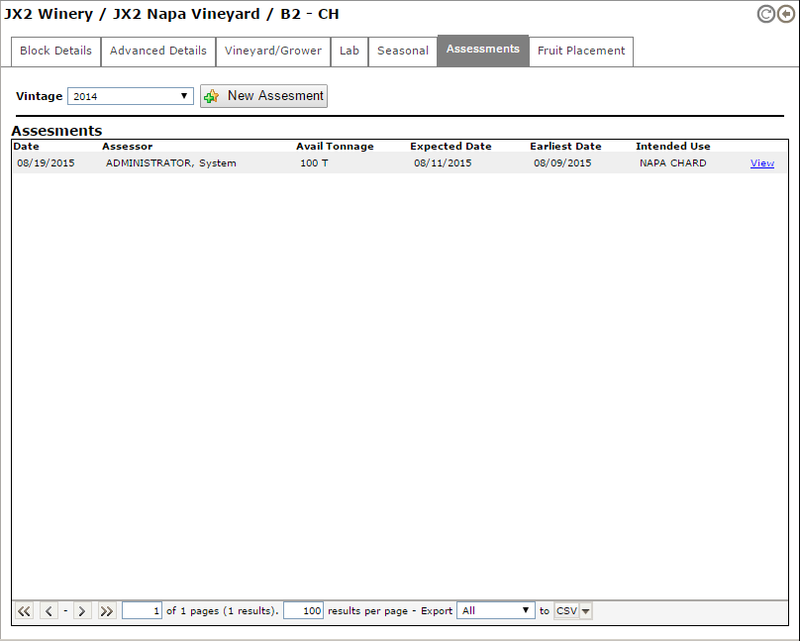 To configure Analysis Templates, enter Winery Setup followed by Production and then select Analysis Template. You may optionally specify the default template for Fruit sampling, Fruit receival and Ferments by changing the option on the Default for field. This will cause the template to be automatically selected in those situations – saving time for the user. Auto codes are automatic naming templates within vintrace that allow entities such as wine batches, weighbridge bookings and barrels to be named based on arbitrary properties. For example, a wine batch code could consist of the vintage, region and variety and a unique number (2007MVLSHZ01). Codes are custom­­isable and we advise that you contact us for assistance in configuring them. If you are familiar with this area of the system they can be configured under Winery Setup – Work-flow – Auto-Code. The default vintage is configured under Winery Setup > Work-flow > Defaults and should be set to the current year before clicking Apply. Many other system defaults can be found and configured here. At the end of each day during vintage we encourage you to run the Grape Delivery Report and Crush/Extraction Report under Winery Reports > Vintage/Harvest. Note the new Email… button in the upper right corner. This allows you to generate and instantly email the report to one or more recipients. These reports provide a detailed list of all deliveries and all extraction rates from which you can check the validity of data entered by the weighbridge and crush/press operator. Please note that you can configure a load threshold for the weighbridge, as well as a minimum and maximum extraction rate in order to alert the user to potentially incorrect data as they enter it. The weighbridge capacity is configured under Winery Setup – Equipment – Scales. Minimum and maximum extraction rates are configured under Winery Setup – General – System Policy – Edit Threshold Settings.